David Bowie Is....a fantastic trip down memory lane. I grew up in the 70's, with the albums, Diamond Dogs, Aladdin Sane, and The Rise and Fall of Ziggy Stardust and the Spiders From Mars, on high rotation on the record player at home, thanks to my Mum and older sisters. I may not have been old enough to understand what he was singing about, and I am guilty of singing "the stuff that gets in it" for many, many years, instead of the actual lyrics to Suffragette City, but hey, man - oh, leave me alone - I was just a kid. The hair, the makeup, the glitter, the costumes, the platform shoes; the songs about dogs, and stars, and astronauts, and genies - that's all that mattered. 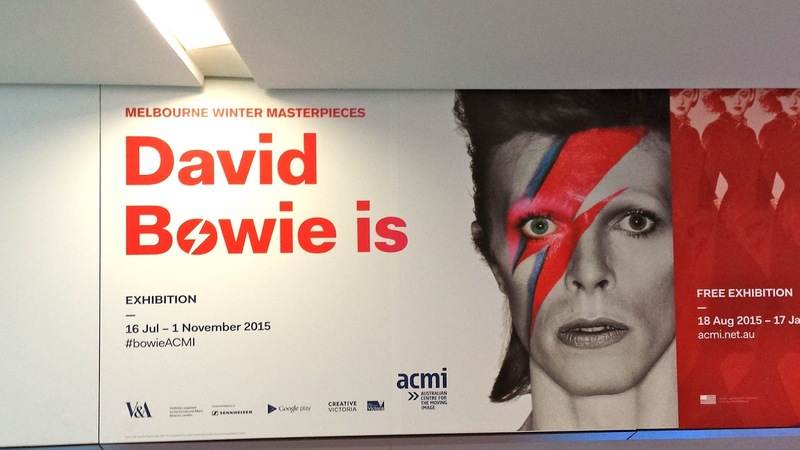 Bowie Was and Bowie Is a musical idol of mine and probably always will be. That weren't no D.J. that was hazy cosmic jive"
It was a bit crowded at the start, but the exhibition is not in chronological order, so you can meander around and avoid the busy hot spots until there is more room. A fantastic collection of costumes had me reminiscing about watching the associated music video clips on Countdown on a Sunday night; movie posters promoting the films Bowie starred in (still swooning over Jareth the Goblin King in Labyrinth); hand written lyrics to some of his most famous songs - the exhibition is packed with nostalgia and had me wanting to come back again for another look and listen. 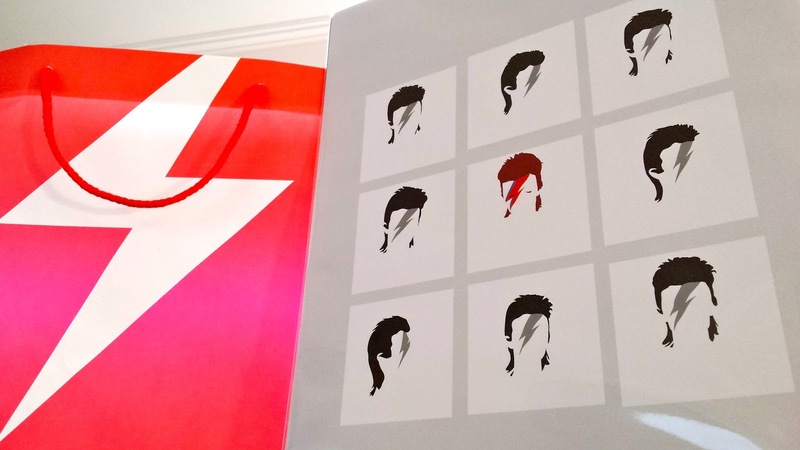 A quick visit to the gift shop resulted in the purchase of this cool print and a totally Bowie-esque bag to carry it back to the car. Special thanks to the friendly staff on the door, for suggesting we cloak our jackets, as it was very warm in the gallery.